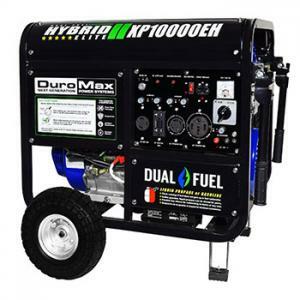 Be ready for anything with the DuroMax XP10000EH generator. Equipped to run on either gasoline or liquid propane this dual fuel unit can perform anywhere that portable power is needed. Easy to transport over any terrain, from the neck of the woods to the downtown jobsite the XP10000EH generator will keep you going. Compared to gasoline, liquid propane is fuel efficient, less expensive and has a longer storage life.